A telling picture of Kinshasa by photographer Pascal Maitre. This quote from a source in Robert Draper’s National Geographic piece on Kinshasa would be an apt description of most any sprawling African capital. Often the first thing a visitor notices is the helter-skelter of the roads where, as a driver, anything you can get away with seems to fly. Thousands of the city’s 10 million inhabitants live day-to-day – polishing shoes, selling hand-me-down pants, or begging for handouts – and it would seem that most of the 500,000 coming in every year will do the same. Even verbal communication blends a dizzying melange of local and colonially imposed languages. But as Draper points out, a rhythm, an order exists to the people living here. It’s not one we Westerners can easily understand. Just as Eastern music written with a 5-beat meter can clang discordant in our Western ears so accustomed to 2 or 4 beats per measure, the swirl and chaos (two words Draper uses to great effect) on Kinshasa’s streets are disorienting. But just because we can’t hear the melody doesn’t mean it’s not there. We had dinner last night with a couple of fellow Peace Corps Niger alums based in Kinshasa with the State Department. They’ve spent two years here and pointed us toward this article, saying what a marvelous encapsulation of Kinshasa it is. After arriving less than a week ago, I can’t help but agree. Just to sum up for those of you who don’t know, Anne-Claire (my wife) just began a year-long fellowship with an aid organization in the Democratic Republic of Congo. She’ll be learning the ins and outs of working for an aid/relief organization, and I’m lucky enough to tag along in the hopes of finding a few things to write about. We are going to be based in Lodja, in central DRC, but we’re in Kinshasa for the next three weeks. Unfortunately, safety is a concern here in the capital, so with few exceptions, we can’t really go beyond the concession walls of our apartment or the CRS office outside of a car. It’s a little frustrating, brought on by the variety of schemes, ranging from petty street crime to impersonating cops (as well as cops themselves looking to bolster nonexistent government paychecks), that folks use to extract a little cash from visitors. But we’re looking forward to Lodja. Though it’s still a large town of about 100,000 people, it’s much safer and calmer and we’ll be free to move around. 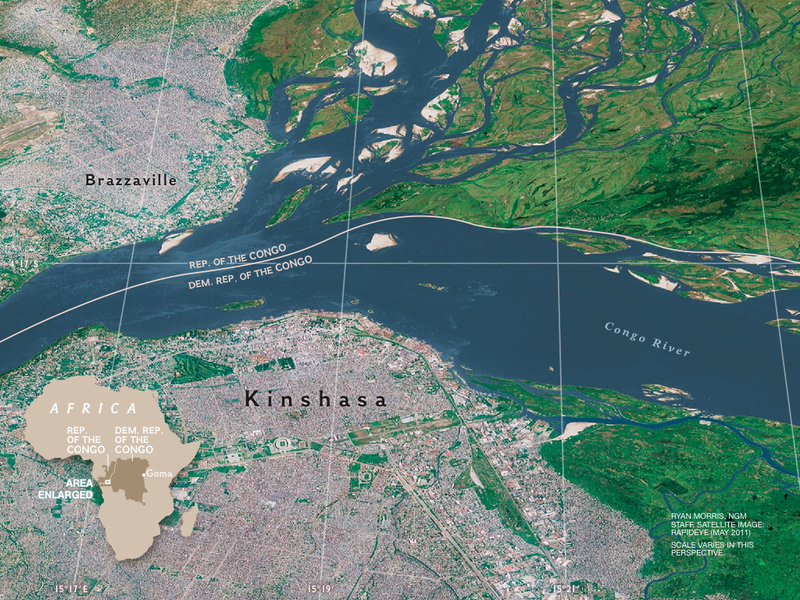 A shot from the article showing the sprawl of Kinshasa and Brazzaville. We also should have at least sporadic Internet access, which means I’m hoping to post to this blog once or twice a week. I have a few ideas for posts, but if there’s anything you’d like to hear more about, don’t hesitate to leave a comment or email me directly. I hope to adhere to the spirit of this blog, which I started a little more than two years ago when Anne-Claire and I were traveling around Europe and West Africa. In a nutshell, my bird’s-eye philosophy on traveling in Africa is that, more so than any place I’ve ever visited, the best experiences come from the people you meet. It’s not a new idea at all and certainly bears application in other places. But it’s here, where existence and survival are stripped to their essence that it’s most apparent, at least to me. So take a look around at our past trips chronicled here, and stay tuned for what’s to come over the next year here in the DRC. If I’ve gotten something wrong and I haven’t been clear, let me have it in the comments or an email. I’d love nothing more than for this site to become a discussion of development and travel, in Africa and elsewhere. If you do have a chance to read Draper’s article, let me know your thoughts. It’s a fun ride through a fascinating city.